PAPER-MAKING, printing and book-binding are all very old industries in Belfast, and are still an important part of the trade of the town. The progress which has taken place has been most remarkable. Paper-making was carried on at Antrim and at Randalstown by Francis Joy. It is now manufactured at Ballyclare, where there are extensive paper-mills, and a large number of people are employed. In 1749, Francis Joy received a grant of £200 from Parliament for improvements, and he introduced the first machinery in the North of Ireland for making paper. 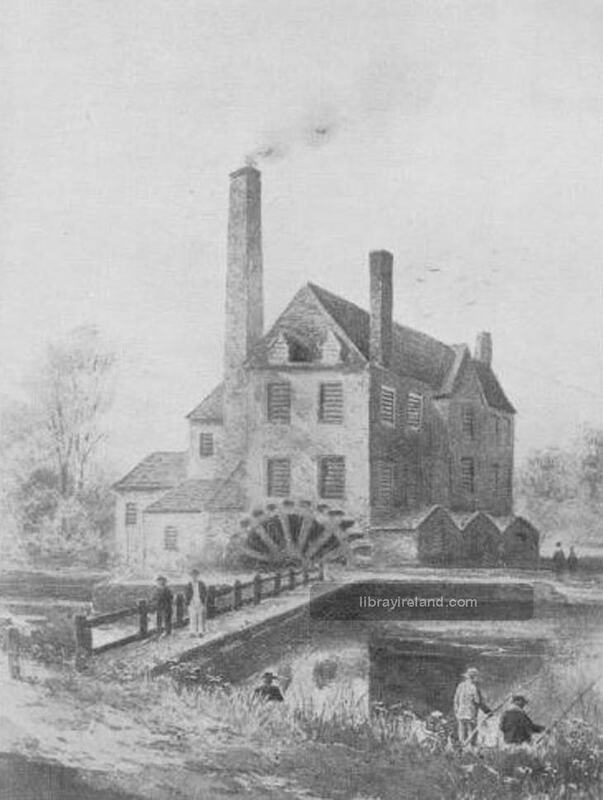 His mills at Antrim were erected in 1776, but they were burnt down and then rebuilt. 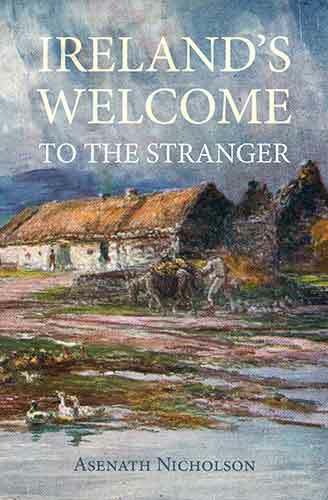 A man named McManus, who had lived in France, came to Ireland about that time. He settled in Dunmurry and introduced paper-making there. Mr. Henry Joy had the old paper-mill which was worked by the water of the Blackstaff river. It occupied the ground between Joy Street and where the Gas Office now is in Ormeau Avenue, but not a vestige of it remains at the present time. In the year 1803, he advertised that he had removed his place of business to Pottinger's Entry, where all kinds of paper suitable for shops could be had. When Henry Joy used his water wheel at Blackstaff River, there was only one other water wheel in Belfast, which was of a much older date, and was in a corn mill. It was at the old Manor Mill in the days of Queen Elizabeth, and later on it was used to grind the meal for the Parliamentary troops in the seventeenth century. Shane O'Neill had the first printing-press in Ireland. He kept it in Shane's Castle, and used it there. The first printing-press in Belfast belonged to Mr. James Blow in the year 1690. A Bible is still in existence which bears the date of 1702, "printed by James Blow." His original wooden printing-press was used in Youghal until the year 1824. A very beautiful little book, which is also still to be seen, was printed by Patrick Neill & Co. in 1700. It is "The Psalms of David in Meeter " and each page is four inches in length by two and a quarter in breadth. On the first page is written, "David Smith's gift to Belfast Meeting House, 1705." It was beautifully bound in tortoise-shell, and the back, hinges, corners and ornaments were made of solid silver. Mr. David Smith was at that time Sovereign of the town. When John Wesley preached in Belfast in 1789, he was welcomed at the First Presbyterian Meeting House and had a very crowded service in the morning, but he was not allowed to hold a second service, as some sinner had stolen the silver rims and clasp off the Bible, but the "Psalm Book " was left undamaged. The "Belfast Newsletter" was the first newspaper in Belfast. It was printed at the sign of the "Peacock" in Bridge Street in the year 1737, and the paper used was made in Joy's Mill in Randalstown. It was printed twice a week at first, but in 1855 became a daily paper. It was the custom long ago for the newspapers to be carried about and left at houses and offices at a charge of one penny for an hour, but that must have been in very early days indeed, and wonderful changes have taken place in the newspapers since then. For a great many years every newspaper was obliged to pay a tax of one penny on each copy, which was marked on the paper with a large red stamp, but this tax was removed later on. The old Almanacks of Belfast are very interesting. There was one made for the use of the Earl of Donegall in the year 1666. Another in 1678 was a most valuable and curious production. It was two-and-a-half inches long and was bound in shagreen with handsome silver clasps. Well known to all its patron friends. There were many other industries in Belfast from very early times. Leather was an old and important trade and tanning was extensively carried on. Vitriol works were also successful. Sugar refining was in Sugar House Entry. Foundry and iron works were established at an early date. The largest glass works were at Carrick Hill, where pottery, glass and china were manufactured, cut and engraved flint glass being a special production, but the place was sold out in 1809. There was a well-known industry at Lambeg for woollen goods. Blankets were sold from 18s. up to £6 6s., stockings were also made at the same place and had a high reputation. Soap and candle making were also well known and both are still carried on extensively. Brewing beer and whisky are old industries, as whisky has been made in Ireland since the year 1460, and there are now large distilleries in Belfast. The manufacture of mineral waters is a very large and important trade, but it would be quite impossible to mention all the great and growing industries of the city. Business and the progressive methods of conducting business affairs have undergone such changes, that it is curious to look back to the easygoing old days and to realise that the Belfast of to-day is the place where life once ran on such peaceful lines as we read of in such notices as these. A little bookshop at the corner of North Street and Rosemary Street used to be closed now and then, and a card put up in the window with "Gone to Dublin, will be back in a few days." And it was quite customary on a fine day in July to see a notice displayed on the closed shutters of many shops with the intimation " Gone to the Races." No one was ever surprised at this method of business and the customers had to wait until the races were over. In 1822, three weeks frequently elapsed between the time of the steamboat's arrival from Liverpool for there was no undue haste in those happy times, and on the whole, people got on perhaps just as well. The rate of living at the high pressure of the twentieth century does not tend either to longer life or happier days. If we take a map of the world and look closely at it, we shall find Ireland a very small place indeed, and Belfast is not even marked on it. Then take a map of Ireland and we see our city is just a little dot, not very much to look at, but this Belfast of ours possesses four of the biggest things in the world and we may well be proud of our city. It is a curious fact that this small country is known all over the world for four great industries. Messrs. Gallaher's tobacco factory in York Street, Belfast, is the largest manufactory of its kind in the world. The immense building covers four acres of ground and is six stories high. Raw tobacco is sent here, from every country where tobacco grows, to be manipulated and sent back again in many different forms. It gives employment to a great number of people. All over the world Gallaher's tobacco is known. We must now go back to earlier times. Sir Walter Raleigh brought tobacco and potatoes into Great Britain in the year 1585. But we find the custom of smoking is of much greater antiquity in Ireland than the introduction of tobacco into Europe. Bronze smoking pipes are frequently found in our Irish tumuli or sepulchral mounds of great antiquity. Similar pipes made of baked clay have been discovered in all parts of the island. A great battle took place in the tenth century between the Irish and the Danes. Long afterwards among the human bones left on the scene of the battle, many pipes were found. Crofton Croker writes that in the year 1784, in Brannockstown, in Kildare, amongst some remains, an ancient tobacco pipe was found sticking between the teeth of a human skull. Surely that man must have met with a sudden death! Crofton Croker had a great collection of pipes found in the ground about Limerick, Cork and Dublin. A most curious instance which proves the antiquity of smoking is found in Corcumroe Abbey in County Clare. There is a recumbent figure on a monument erected to the memory of Donogh O'Brien, King of Thomond, who was killed in the year 1227 and was buried in the Abbey, which was founded by his family. He is represented lying in the usual position with the short pipe or "dudeen" of the Irish in his mouth. It is a very realistic piece of sculpture. Some of the old pipes are very small. They are called "fairy pipes" and there is a most interesting collection of them exhibited in the Science and Art Museum in Dublin. We do not know what was used by the smokers of long ago, but we may suppose that they used some kind of dried herbs, which must have been a powerful mixture. This would also explain why the pipes were made so small. Among the early records of Belfast we find in the year 1782 there is a tobacco industry mentioned. There were thirty-eight tobacco spinners giving employment to 152 children. During the next ten years every trade had increased except tobacco, and owing to the revenue laws, the trade fell so low that employment was given to only twenty children. Now, in Gallaher's factory alone, the fragrant weed gives constant employment to over 2,000 employees. It is one of the four greatest industrial concerns in the world, and is likely to increase as more tobacco is grown in Ireland. The Customs duty paid yearly is about one million and a quarter. Another factory quite as large is in Virginia. It also belongs to Messrs. Gallaher.